Consider using a retirement income calculator before you go out an hire an expensive retirement planner service. Yes, it is true that planning for your retirement is not done by simply imagining it. And it is also true that there are a lot of numbers involved. The good news it that you can start planning for your retirement well before you ever spend a dime with these expensive professionals. A retirement calculator will help you arrive at the figure you will need for your retirement, and it’s not that hard, so there’s really no excuse not to be on top of this stuff… it is your future after all! You will find that there are many different calculators online which you can use for free. To get your started we’ve listed a bunch of different free retirement calculators that you can use. There are two basic types of retirement calculators, the single-page type and the detailed type. AARP Retirement Income Calculator â€“ What sets this retirement calculator apart from others is the fact that it considers taxes in its calculation. Hence, the retirement income you should have covers the taxes you are expected to pay. Vanguard Retirement Income Calculator – Reviews says that this calculator is fun and cool to use. This is unlike other retirement calculators that show only numbers, because this actually presents the results in graphs and slide bars. How Long Will The Money Last Simple Retirement Calculator â€“ This retirement calculator asks you your current retirement savings plan. It can tell how long your savings will last into your retirement. With this, you can modify your present savings plan if the results show the possibility of you outliving your retirement money. Are You Saving Enough Retirement Calculator â€“ This retirement calculator will look into your current savings plan and correlate it to your projected retirement expenses and life expectancy. It also factors in other income generating sources if you plan to work after retiring. It will tell you if your current savings plan and other income generating resources are enough for your retirement. 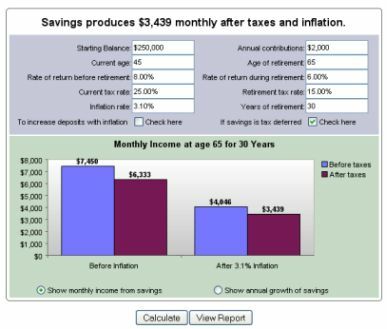 T.Rowe Price Detailed Retirement Income Calculator – This retirement calculator will tell you the money you can spend for each month of your retirement, the chance of your retirement savings to last throughout your retirement, and it will also offer you options just in case your current savings plan does not last. This also incorporates a Monte Carlo analysis which will show how your investments will fare in different market situations. â€œWhat Will My Income Be After I Retire?â€ Retirement calculator by Motley Fool â€“ This retirement calculator will ask you to estimate the tax rates, inflation rates, Rate of ROI and your living expenses during your retirement and your estimated income from jobs after retirement. All this is factored in before it arrives at how much your retirement income will be. CNNMoney.com Retirement Calculator â€“ This is a comprehensive retirement calculator that will tell you how effective your current retirement savings plan is. This will tell you how much you will need during your retirement and how much you should be saving up in order to cover your retirement expenses. Most calculators are easy to use. If you have no idea of the technical terms being used, you need not worry because almost all of them come with definitions of terms to help you better understand.